Superior Townhome On Lake, Wi Fi, Smart TV, Next To Pool! FREE Netflix! 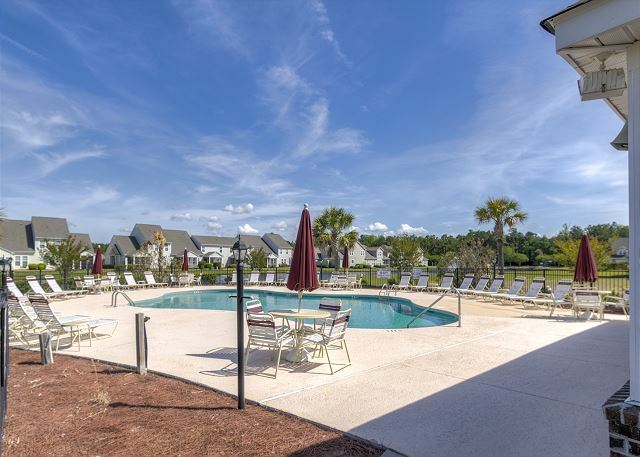 This fantastic townhome has it all, with two levels of resort living, bedrooms up and downstairs, an outdoor porch and located just steps from the refreshing community pool at Heron Bay in Barefoot Resort. 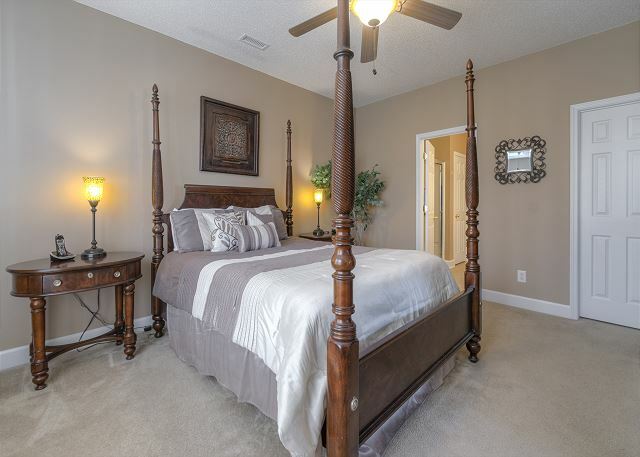 Downstairs is the stunning master suite, impeccably decorated with upscale furnishings and posh bedding. 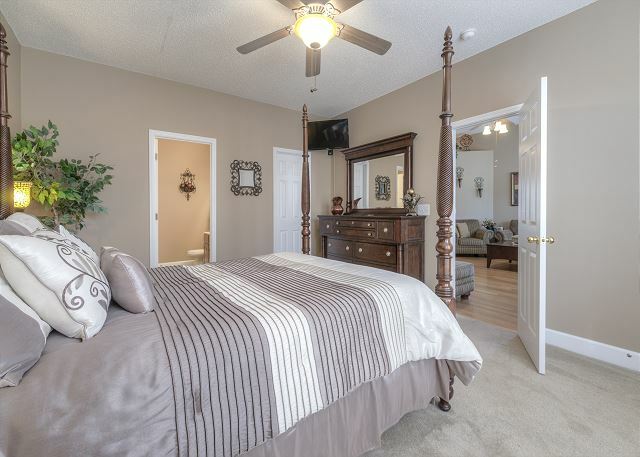 The room has a triple dresser, two night stands, ceiling fan and TV for those late night movies. 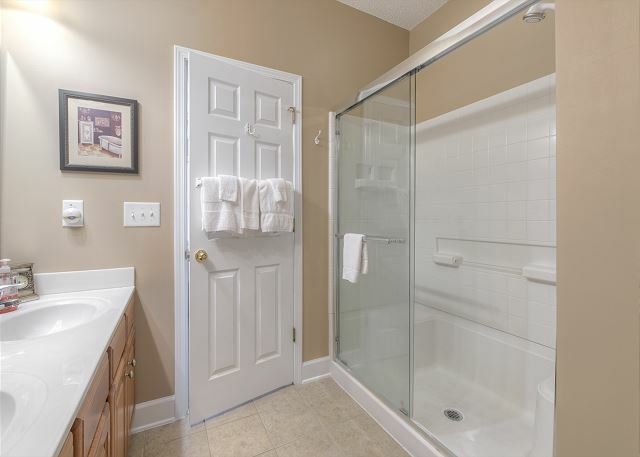 Adjoining the master suite is a spacious private bath suite with an over-sized easy step in shower, his and her sinks, under cabinet storage and a linen closet. 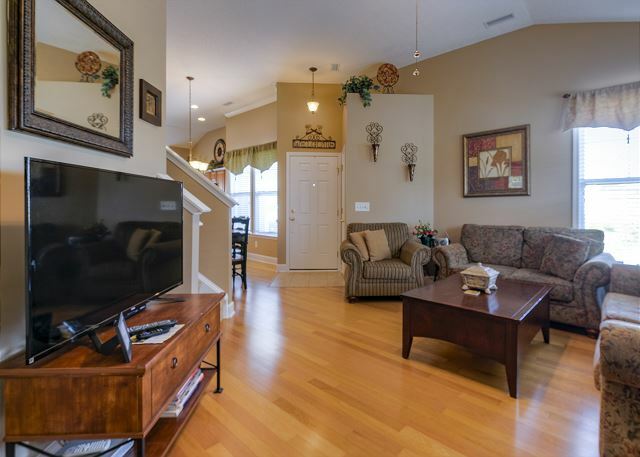 The spacious downstairs living area features a perfectly designed floor plan with a wonderful gathering room, formal dining area, inviting breakfast room with TV and a gourmet kitchen with bar seating. The space is open for conversation, yet separated enough for different activities! 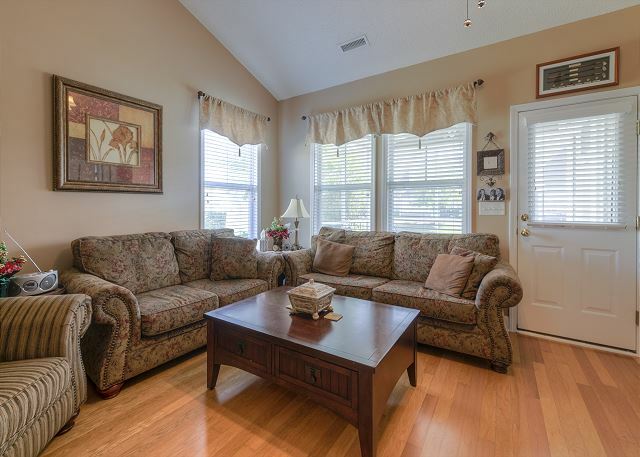 A big screen flat panel Smart TV with DVD player completes the living room entertainment area. And as a special bonus for our guests, we have FREE NETFLIX movies! Plus there is a very nice owner supplied library of movies too, just in case it rains here in paradise! If three bedrooms are not quite enough space, the posh comfy sofa easily pulls out to create a queen sleeper. 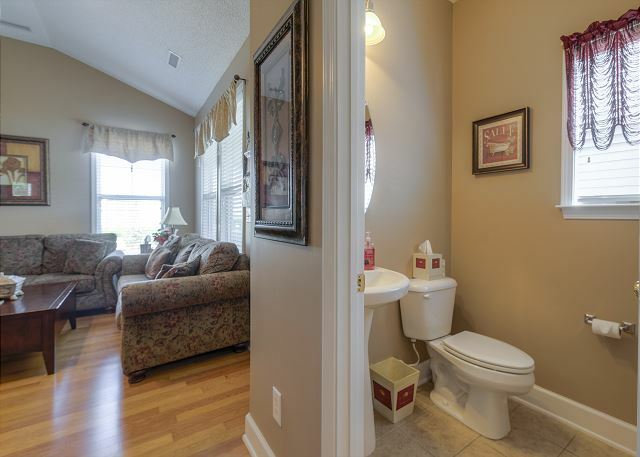 A half bath off the living area conveniently serves you or friends dropping over. 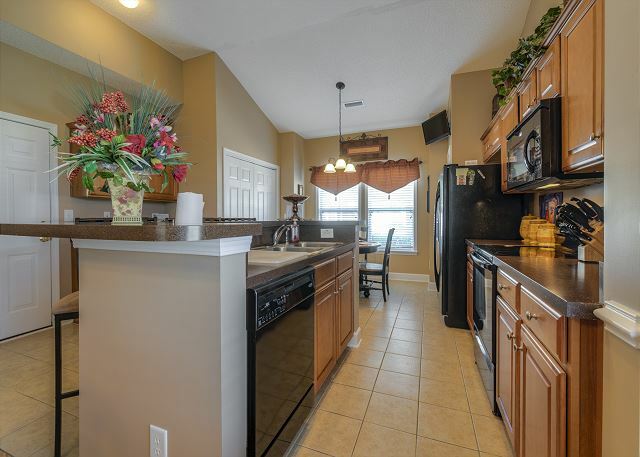 The gourmet kitchen is completely stocked with beautiful dishes, small appliances and plenty of cookware. 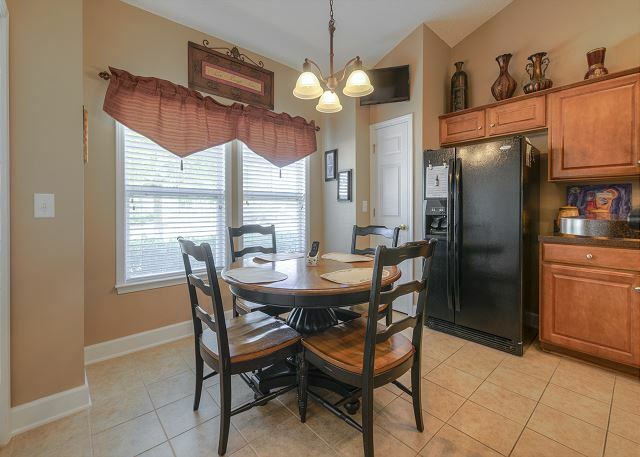 Keep the cook company at the bar overlooking the kitchen. 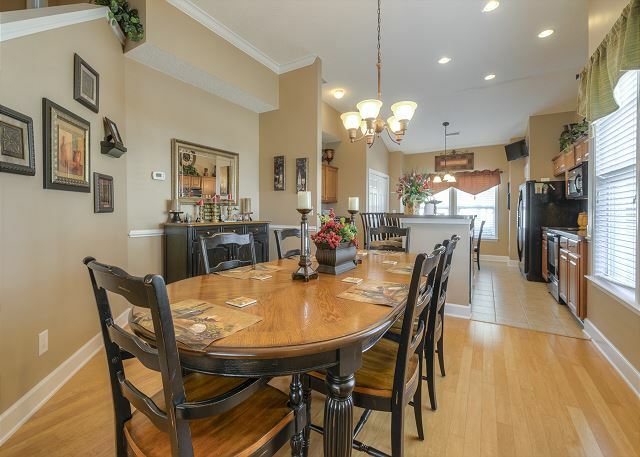 The striking formal family dining room is just off the kitchen and with the breakfast room and bar close by, there is plenty of seating to accommodate your entire group. 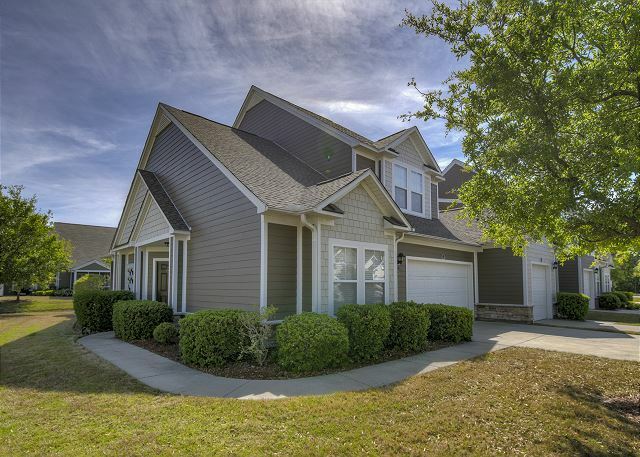 The full size laundry room is conveniently located off the kitchen area, as is the two car garage with direct access into the home from the garage. We have beach chairs and some pool toys in the garage guests to use. The driveway provides space for two vehicles. Please note that street parking is not permitted! 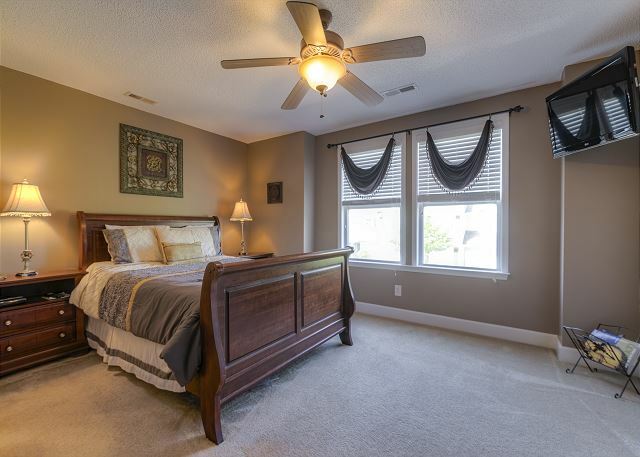 Upstairs are two more spacious bedrooms. 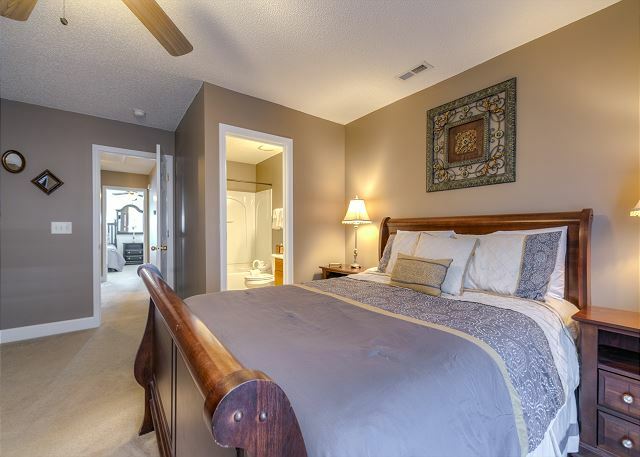 One serves as a second master suite, outfitted with beautiful queen size sleigh bed, chest, large closet and a TV. A private full bath suite joins this room. 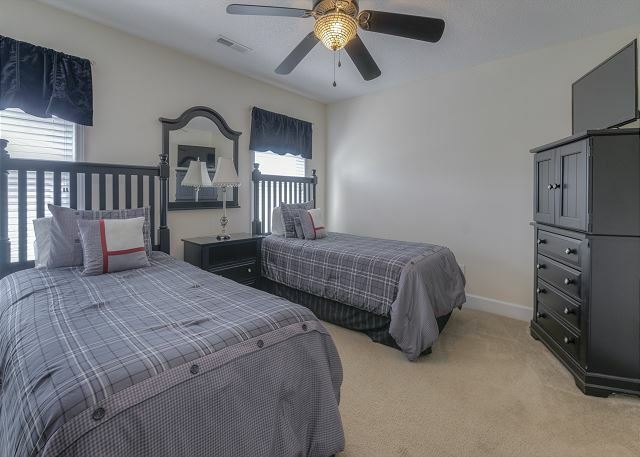 Another bedroom has two twin beds and another TV in an armoire with clothing storage, walk in closet, ceiling fan and lovely views of the community. 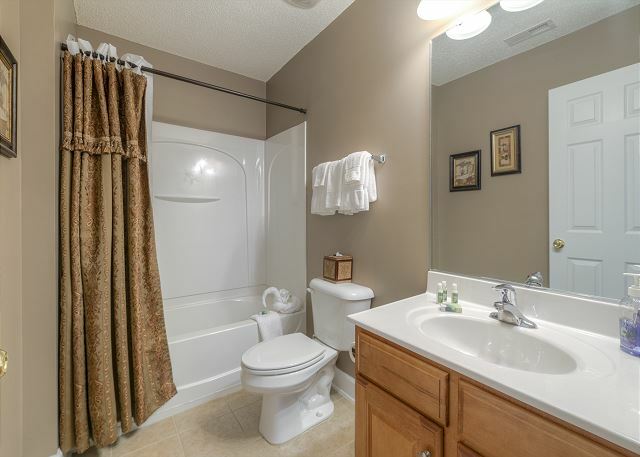 There is a third full bath in the hall serving the twin bedroom. 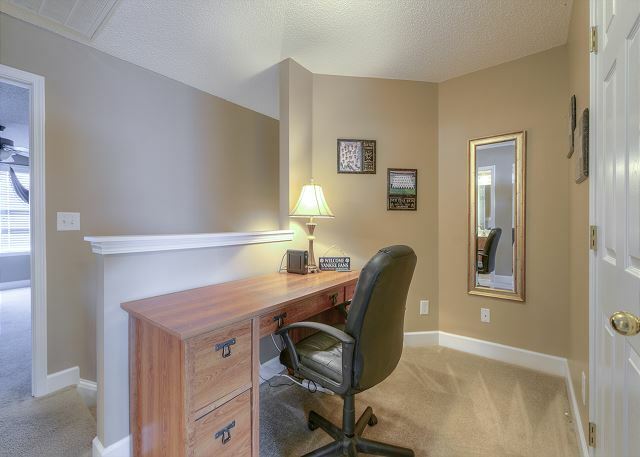 The loft upstairs provides guests with a home away from home office if you need to take care of business. 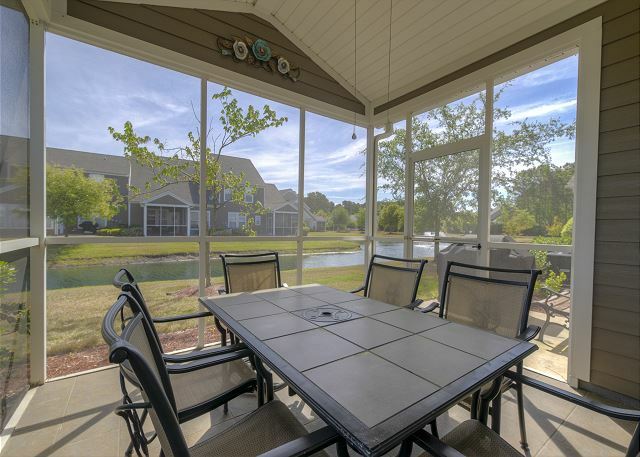 Relax and enjoy the tranquil sounds of nature from the screened and furnished porch off the great room. 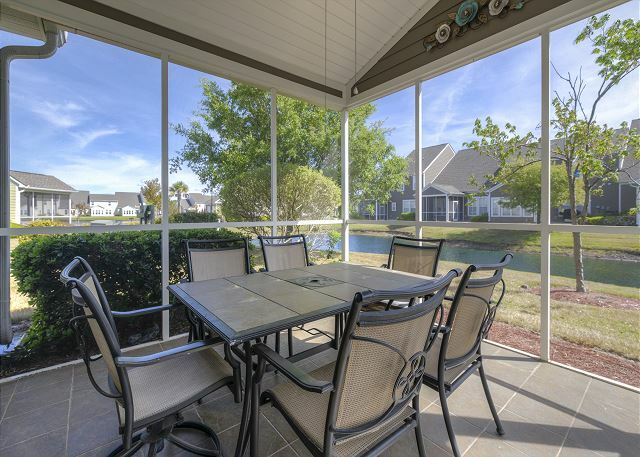 Grill some burgers or steaks on the big outdoor BBQ grill on the patio. 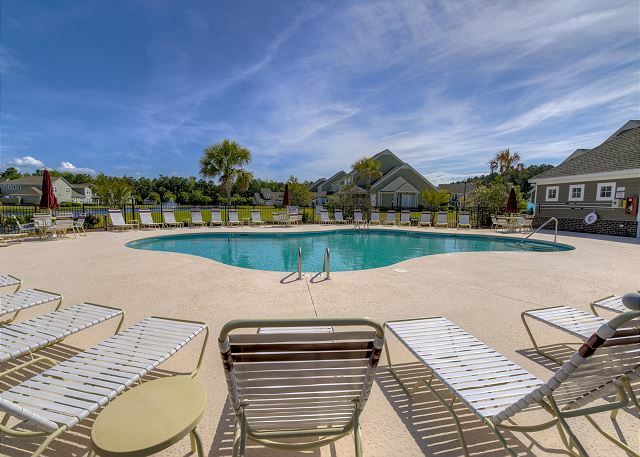 There is a huge backyard for outdoor games and just a few steps out the back door is the community pool, complete with lounge chairs, umbrella tables, full bathrooms, showers and more! It just does not get any better than this! 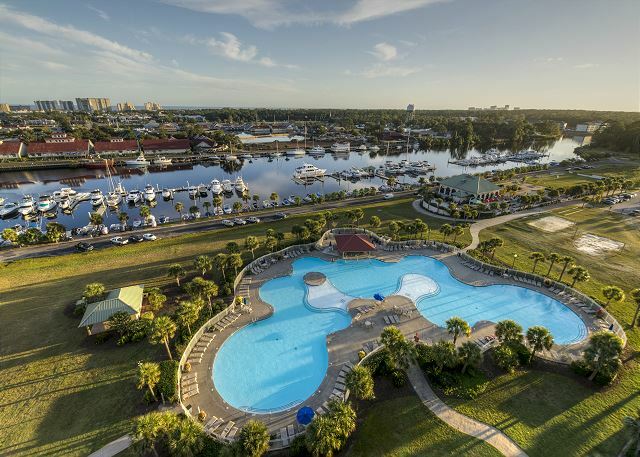 Be sure read about all of the amazing amenities you will receive by being a guest at Barefoot Resort too, including our complimentary, in season, shuttle service to our oceanfront! There you have covered picnic tables, vending, showers, a clean full service restroom maintained by resort staff and deck walk to the sand and surf! Life guards are right there with chair and umbrella rentals. Call us or reserve online for an unforgettable vacation!